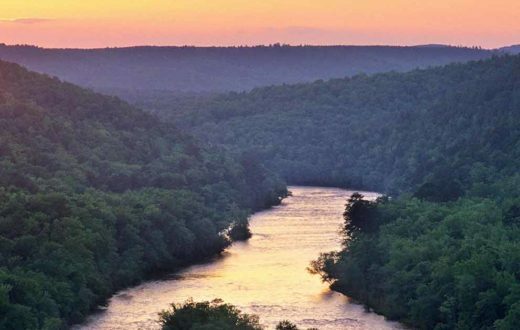 The United States has more than 2.9 million miles of rivers. They range from small streams and wetlands to large waterways. No two of these rivers are the same. Each river is unique to its landscape, winding through low foothills and valleys, rushing clear and cold from mountain forests, or sweeping warm and muddy down desert canyons. 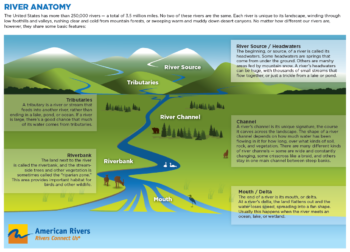 No matter how different our rivers are, all rivers share some basic anatomy features. What parts make up a river? A tributary is a river that feeds into another river, rather than ending in a lake, pond, or ocean. 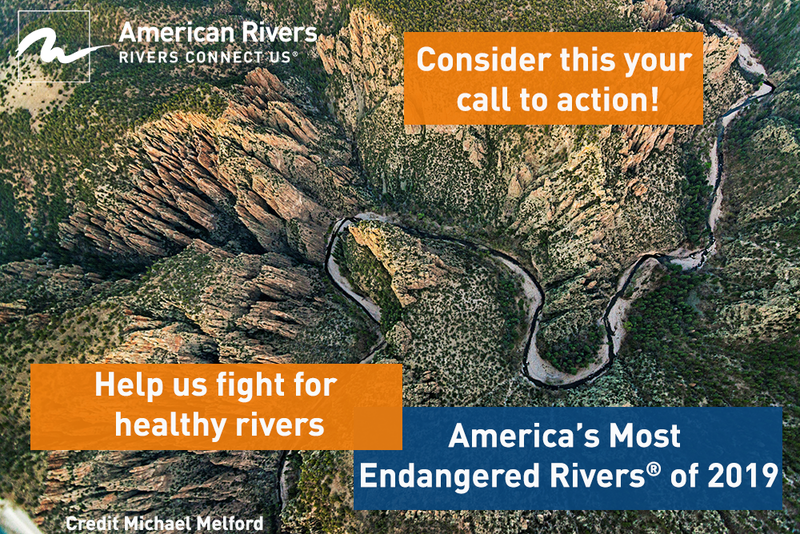 If a river is large, there’s a good chance that much of its water comes from tributaries. How do geographers decide which river is the “main” river and which is the “tributary” when they’re naming rivers? Usually the bigger river gets to be the “main” river, but sometimes history or other factors come into play. The beginning of a river is called its headwaters. Even if a river becomes big and powerful, its headwaters often don’t start out that way. Some headwaters are springs that come from under the ground. Others are marshy areas fed by mountain snow. A river’s headwaters can be huge, with thousands of small streams that flow together, or just a trickle from a lake or pond. What happens in the headwaters is very important to the health of the whole river, because anything that happens upstream affects everything downstream. The shape of a river channel depends on how much water has been flowing in it for how long, over what kinds of soil or rock, and through what vegetation. There are many different kinds of river channels – some are wide and constantly changing, some crisscross like a braid, and others stay in one main channel between steep banks. The bends in a river called “meanders” are caused by the water taking away soil on the outside of a river bend and laying it down the inside of a river bend over time. 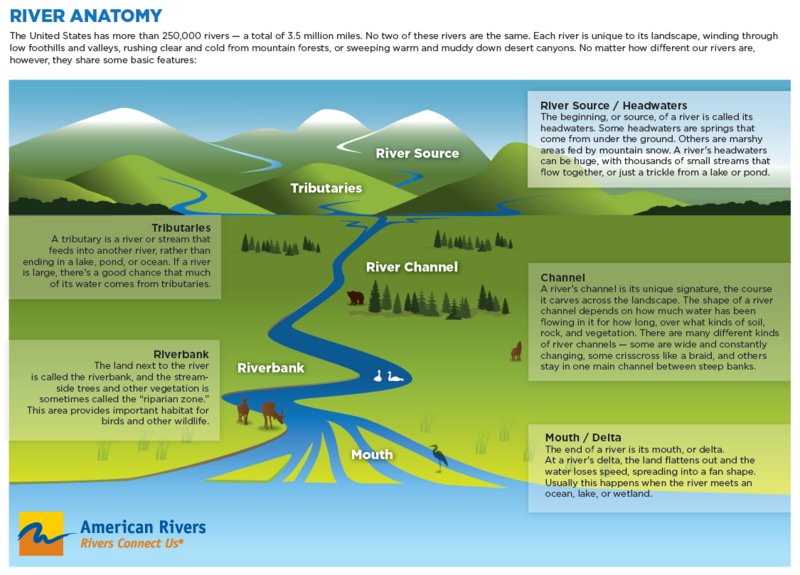 Each kind of river channel has unique benefits to the environment. The land next to the river is called the riverbank, and the streamside trees and other vegetation is sometimes called the “riparian zone.” This is an important, nutrient-rich area for wildlife, replenished by the river when it floods. In the West, these riverside areas provide habitat for more bird species than all other vegetation combined. These areas also provide valuable services like protection from erosion during floods, and filtering polluted run-off from cities and farms. Floodplains are low, flat areas next to rivers, lakes and coastal waters that periodically flood when the water is high. The animals and plants that live in a floodplain often need floods to survive and reproduce. Healthy floodplains benefit communities by absorbing floodwaters that would otherwise rush downstream, threatening people and property. 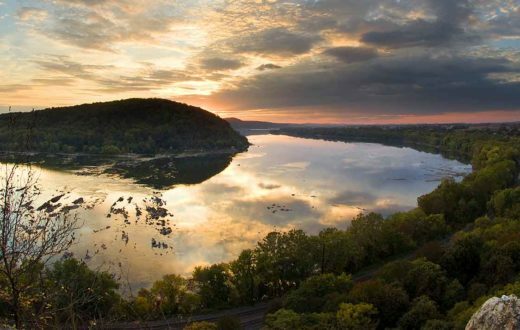 It has been estimated that restoring the 100-year flood zone of the five-state Upper Mississippi River Basin could store 39 million acre-feet of floodwaters — the same volume that caused the Great Flood of 1993 — and save over $16 billion in flood damage costs. The end of a river is its mouth, or delta. At a river’s delta, the land flattens out and the water loses speed, spreading into a fan shape. Usually this happens when the river meets an ocean, lake, or wetland. As the river slows and spreads out, it can no longer transport all of the sand and sediment it has picked up along its journey from the headwaters. Because these materials and nutrients help build fertile farmland, deltas have been called “cradles” of human civilization. Deltas are “cradles” for other animals as well, providing breeding and nesting grounds for hundreds of species of fish and birds. Wetlands are lands that are soaked with water from nearby lakes, rivers, oceans, or underground springs. Some wetlands stay soggy all year, while others dry out. Although wetlands are best known for providing habitat to a wide variety of plants and animals, they also help protect our communities by acting as natural sponges, storing and slowly releasing floodwaters. 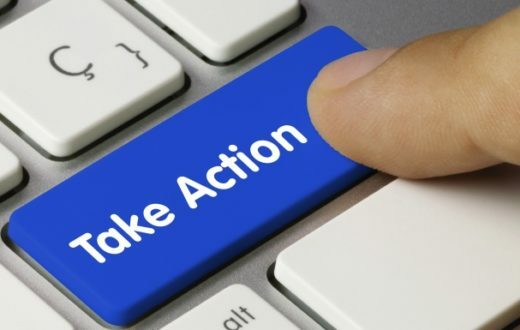 A single acre of wetland, saturated to a depth of one foot, will retain 330,000 gallons of water – enough to flood thirteen average-sized homes thigh-deep. Wetlands also help provide clean water by naturally filtering out pollution. “Flow” refers to the water running in a river or stream. 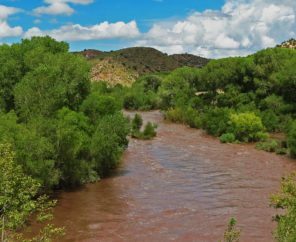 There are two important aspects to a river’s natural flow. First, there is the amount of water that flows in the river. 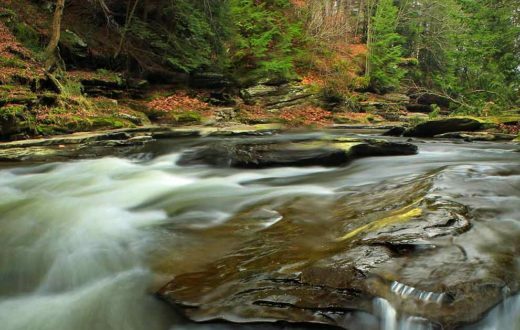 Some rivers get enough water from their headwaters, tributaries, and rain to flow all year round. Others go from cold, raging rivers to small, warm streams as the snowpack runs out, or even stop flowing completely. 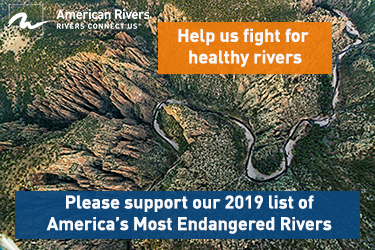 A river’s natural ups and downs are called “pulses.” Like a human being’s pulse, a river’s natural flow of water is life support for animals, plants, and fish, delivering what they need to survive at the right times. When we divert water away from a river, we change the river’s natural flow. The second component of natural flow is how water moves through a river’s channel. In a natural, wild river, the water runs freely. But in more developed or degraded rivers, dams and other structures can slow or stop a river’s flow. When a river’s flow is blocked, migratory fish like salmon can suffer, unable to move up or downstream.